The Kates Basin fire was ignited by lightning on August 5th, 2000 on the Wind River Indian Reservation in Wyoming. This fire and the Blondie Pass #2 fire were reported to Fort Washakie Dispatch Center at approximately 1400 hrs on August 7th. Initial attack proceeded immediately as directed by Agency Forester and Fire Management Officer, Bob Jacob. Operation of the fire was under Incident Commander Type 4 (ICT4) Mike Brown. The Kates Basin fire and Blondie Pass #2 were initially managed as separate fires, with Charles Chavis serving as IC on Blondie. 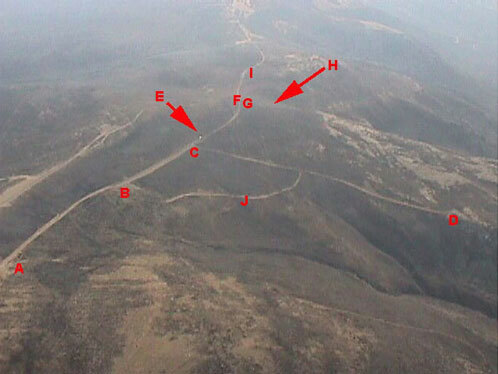 Fuels ranged from heavy timber on the Blondie Pass #2 to grass and low sagebrush (<18 inches) on the Kates Basin Fire. Pockets of juniper occurred throughout the fire area. The weather was in a hot, dry pattern with red flag warnings posted for the zone on August 10th and 11th for low humidity and gusty winds. Fort Washakie Dispatch, working through the Cody Dispatch Center and the Rocky Mountain Coordination Center, made several requests for resources, particularly engines and crews. A Type II Incident Management Team was requested on August 10, 2000. Competition for resources was tight because of several other larger fires burning in the geographic area and in other areas of the country. One strike team of four (4) Type 6 engines had been ordered on July 30th for the Middle Enos fire. This strike team consisted of Chickasaw Nation #2, and Oklahoma Engines #2, #4, and #10, and were signed on under emergency rental contract with the U.S. Forest Service, Region 8. This strike team was released from the Worland District Bureau of Land Management, Middle Enos fire on August 10th. One of the engines, Chickasaw Nation #2, was assigned directly to the Kates Basin Fire. The other three (3) engines, Oklahoma Engines #2, #4 and #10 were assigned on severity to the Worland BLM for initial attack. Worland agreed to loan two engines, Oklahoma Engines #2 (1997 Ford, F-350 model) and #10 to the Kates Basin fire with the understanding that they would return to Worland if needed for initial attack. Oklahoma Engines #2 and #10 reported to the Kates Basin fire the afternoon (estimated 1500 hours) of August 10th. They were assigned suppression duties to the north of the Mexican Pass area and worked until approximately 2230 hours. They then bedded down next to their engines at the "Dip Tank" camp. The August 11th shift started at approximately 0500 hours with a briefing at 0830 hours by the incident commander. During this briefing the forecasted weather, transmitted to IC Brown at 0630 hours, was discussed. Engines #2 and #10 were assigned suppression duties in the same area as the evening before. At approximately 1230 hours Engine #2 and #10 were directed to report to the Mexican Pass area to assist in holding line in that area. Due to unfamiliarity with the area, Engines #2 and #10 went to the west side of the fire and began working on active fire. While topping off their water tank, Foreman Burnett was directed by radio to the Mexican Pass area. Engine #10 had to refill with water and proceeded to Mexican Pass 20-30 minutes behind Engine #2. The fire was making runs toward the two-track road and slopping over the grader check lines that were put in to check the spread of the fire. Oklahoma Engine #2 left Hot Springs County Engine #7 to scout the two-track and dozer line (Point B-C-D). Burnett realized they could not hold the line and decided to turn around at the intersection of the two-track road and the dozer line (Point C). At the same time the winds picked up to an estimated 40-45 mph causing rapid rates of spread and observed flame lengths of 25-30 feet. This caused Engine #2, now headed west, to retreat in reverse to the east up the two-track road and to become entrapped (Point E). After backing approximately 60 feet, Foreman Burnett told Crewman Presley Byington (driver) to remain in the engine while he wet down the immediate area for vehicle/crew protection. Burnett then left the vehicle and started the pump. Byington reported the pump engine ran for only 4 - 5 seconds before it quit. Burnett ordered Byington to back the engine in a retreat to the east, but the engine stalled after moving approximately ten feet. Burnett then separated from the engine, retreating east up the two-track. When Byington realized the flaming front would quickly reach the vehicle, he decided to move from the driver’s side and exit on the passenger’s side of the vehicle. When strong winds prevented him from opening the door, Byington attempted to lie down on the floor of the vehicle, but the gear shift lever and 4X4 selector prevented this move. He opened his shelter inside the cab of the engine. While in a sitting position on the passenger side he wrapped the shelter around himself. Hot Springs County Engine #7, recognizing Engine #2 may be in trouble, proceeded east with hoses deployed. After finding Engine #2 on fire, they suppressed the fire and found Byington alone in the cab. Byington had minor burns and smoke inhalation, but was conscious and mobile. They moved Byington into their engine and then discovered a small fire on their own engine. While Hot Springs County crew extinguished the fire on their engine, Byington retrieved a handheld radio from Engine #2 and contacted Burnett. Burnett responded and expressed concern about Byington’s welfare. Byington reports that Burnett seemed calm and reported that he was "O.K." at this time. Due to heavy smoke and active fire conditions, Hot Springs County Engine #7 put Byington back in their cab and moved west away from the fire. Burnett retreated up the two-track for approximately 900 feet, where he left the road to the south (Point F). He lost his hard hat approximately 30 feet from the road (Point G). Jim Burnett was overcome and fatally injured by the fire approximately 230 feet south of the two-track road (Point H) at approximately 1430 hours on August 11, 2000. He was found clutching a hand-held radio with a partially deployed fire shelter, approximately 200 feet from unburned fuel. At about this time, Oklahoma Engine #10 had arrived and was wet-lining above the two-track road to the north toward a control line being put in on the ridge by a road grader. Hearing radio traffic of the accident, Foreman Kelly Stout proceeded back to the two-track road and headed east to search for Burnett. Engine #10 proceeded around Engine #2 east toward the ridge top, but did not locate Burnett. At 1450 hours, Fort Washakie Dispatch, Don Mitchell, Bob Jacob, and Superintendent Perry Baker were notified of the accident. Two helicopters (43T & 53F) were dispatched at 1454 hours. Both helicopters looked for Burnett and discovered the fatality. Helicopter 43T transported Byington to the Riverton Hospital. Marc Rudkin, helicopter crew member for helicopter 43T, confirmed Burnett’s condition and proceeded to secure the site. Rudkin remained on-site until law enforcement personnel arrived. Agency personnel immediately began the serious accident notification process. Agency law enforcement personnel investigated the site, and the Hot Springs County Coroner responded to the site and removed the body. Presley Byington arrived at the Riverton Memorial Hospital at 1531 hours. He was treated for first degree burns and smoke inhalation. He was released at 1300 hours on August 12th, and was was checked into the Riverton Holiday Inn to await transportation home. On review, it was discovered that Byington had no one assigned to him from the agency while in the hospital or in the motel. There was no one to provide him with information, to assist him, or to handle calls from the media. He and the four other Oklahoma firefighters returned home on August 13th by chartered aircraft. Byington continued to receive treatment for respiratory problems after returning home. As the accident was occurring, the NorCal #2, Type II Incident Management Team (IMT), was arriving to take over the fire. Deputy Incident Commander John Wendt and Safety Officer Mike McCourt were assigned to gather information about the entrapment and to assist investigation efforts. They also assisted the Oklahoma firefighters from Engines #4 and #10 . The fire was transferred to the IMT at 0600 hours on August 12th. A serious accident investigation team was formed the evening of August 11th and arrived in Riverton, Wyoming in the early afternoon of August 12th. The team was briefed and given a delegation of authority to conduct the investigation at about 1400 hours on August 12th.